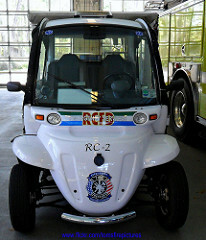 Reedy Creek, plans to staff two more roving medical units around the resort. Next year’s budget, which is in the process of approval, will include six new Reedy Creek paramedic positions to staff MARC (medical assistance response cart) positions. The small vehicles carry medical supplies but are not set up to transport patients. They can be used in lieu of ambulances — either before one gets to a scene or if one is not needed. They are “a lot more efficient for us,” Reedy Creek District Administrator John Classe said. One unit will roam around the property. Another will be based at Disney Springs.